Origin and Habitat: Queretaro, Michoacan, Zacatecas, Mexico, Jalisco, and Hidalgo. Habitat: It grows in high table-lands, in fertile soils. 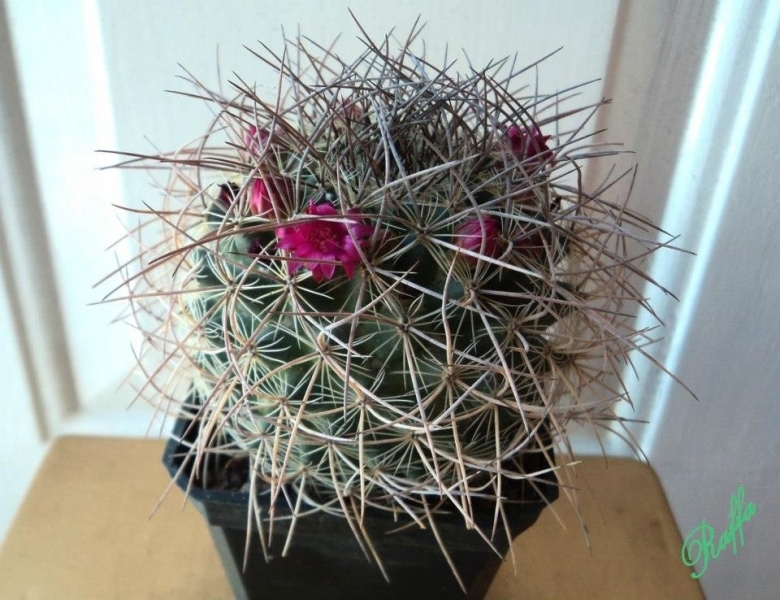 Description: Mammillaria rhodantha is a shortly columnar cactus that characteristically divide dichotomously with age forming large clumps. The spines are the more variable of the trait and a great variety of forms can be found in cultivation. Stem: Short cylindric or clavate, dark green, usually ranging from 15–30(-40) cm in height and up 8-10(13) cm in diameter. White wool can be seen growing on the top part of the plant body. Tubercles: Conical to cylindrical, without latex. Central spines: About 4 to 6 straight, or somewhat curved up to 1,5 cm long, vividly coloured reddish-brown but also straw-coloured or golden yellow. The bottom half of the cactus has spines that are white or grey and appear to be dying. Radial spines: Approximately 16 to 24, 3-10 mm long, glossy-white or yellowish. Flower: Deep-pink to a purple colour, 20-23 mm long and 15-18 mm in diameter, stigmas usually purple. Blooming season: The species flowers for very long periods of time. It starts blooming in the spring and continues to bloom until summer, but some plant will produce another ring of flowers in late October or even November. Fruit: 15-25 mm long. Cylindrical to club shaped, purplish-pink frequently greenish at the base. 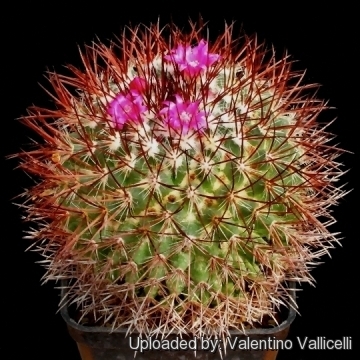 Mammillaria rhodantha Link & Otto: (ssp. 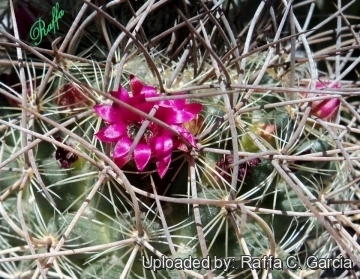 rhodantha) Plant with 17-24 glassy white radial spines and 4-7red to reddish brown central spines; Distribution: Hidalgo, Michoacan, Queretaro, and Guanajuato. Mammillaria rhodantha subs. aureiceps (Lem.) D.R.Hunt: Plant with about 25 golden yellow radial spines; Distribution: North of Mexico City on the Cerro de Chiquihuite, and in Guanajuato and Queretaro. Mammillaria rhodantha f. cristata hort. : red-brown spined cristate that forms superb brain-shaped mounds up to 50 cm wide. Mammillaria rhodantha subs. fera-rubra (F.Schmoll ex R.T.Craig) D.R.Hunt: Plant with 15-18 radial spines and smaller flowers; Distribution: Queretaro, Michoacan, and Zacatecas. Mammillaria rhodantha subs. mccartenii D.R.Hunt: Plant with 13-15 radial spines; Distribution: Michoacan and Zacatecas. Mammillaria rhodantha subs. mollendorffiana (Shurly) D.R.Hunt: Plant with 24-28 radial spines and small flowers; Distribution: Northwest Hidalgo. Mammillaria rhodantha subs. pringlei (J.M.Coult.) D.R.Hunt: Plant with 18-22 glassy white radial spines and yellow central spines; Distribution: Mexico, Jalisco, Guanajuato, and Queretaro. Mammillaria rhodantha subs. pringlei f. cristata: golden-yellow spined treasure that forms superb brain-shaped mounds up to 50 cm wide.